In a few weeks, we’re going on our first big family road trip for a family reunion in Utah. That’s gonna be over ten hours in the car with my husband and three kids. You guys… I’m going to DIE! You don’t understand! I can barely make it two hours in the car before I’m driven insane with the whining and meltdowns. TEN HOURS!!! I still don’t know why I agreed to this, and I’m sure I’m going to want to turn around and drive home three hours into it, but it’s happening now. 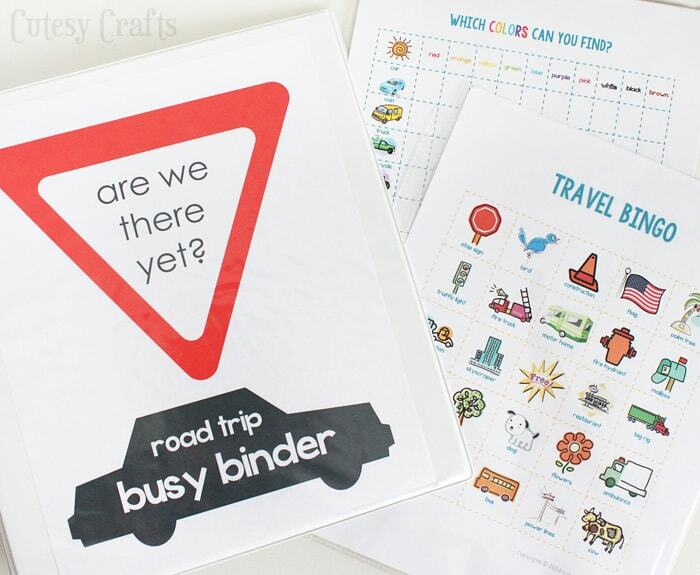 I’m trying to prepare ahead of time for the trip, so I made some busy binders that are full of fun road trip games and other things to keep the kids busy. 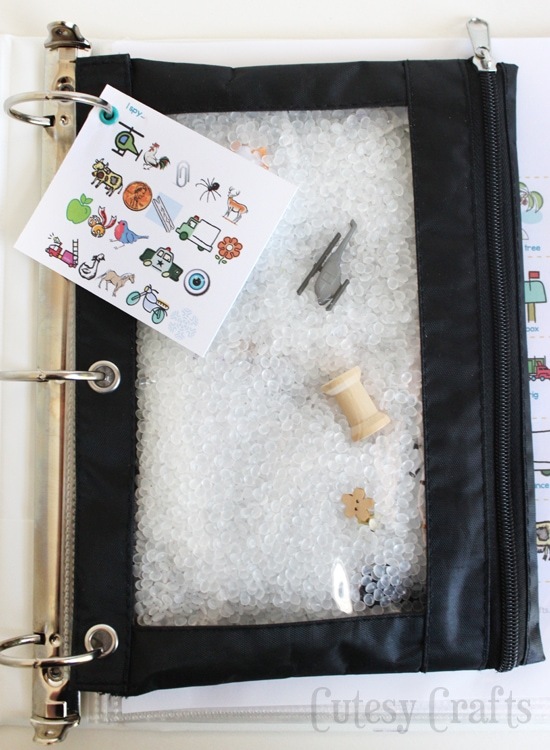 The binder opens up to an i-spy bag made from a pencil pouch. You know, one of those ones with the clear front. 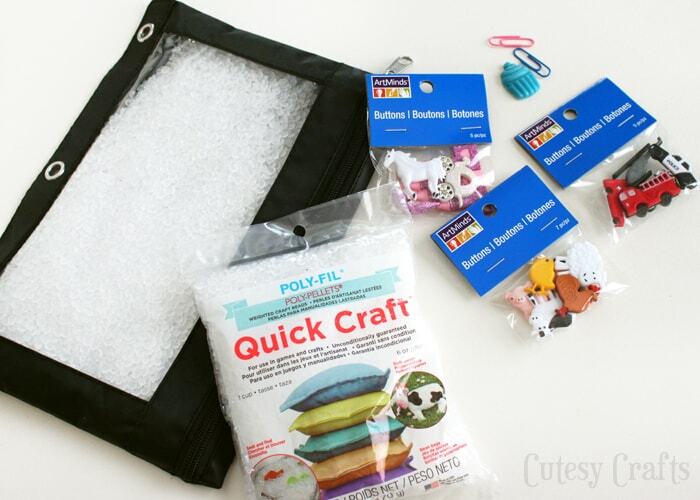 Just fill it with poly-pellets and throw in some cute buttons and random things around the house. 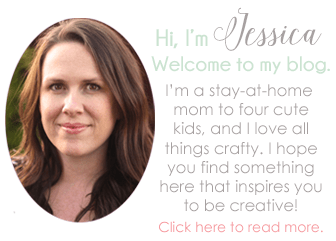 This genius idea came from A Girl and a Glue Gun, so be sure to check hers out. She made hers using beads instead of poly-pellets. The pellets I bought were in the clearance section at JoAnn’s, so I don’t know how easy they are to come by. Make a little tag with clip art that shows what’s inside. The kids will stay busy trying to find everything on the tag. I’ll probably sew or glue the opening shut because I don’t trust my kids to keep the zipper closed. Wouldn’t that be fun to clean up in the car?! 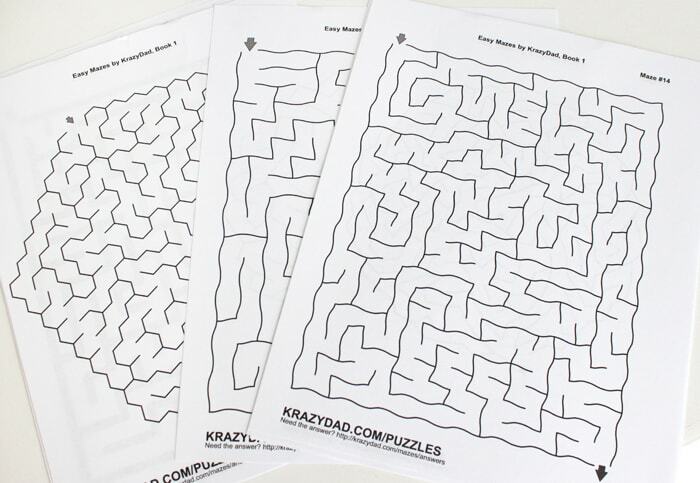 I also created some fun printable road trip games. 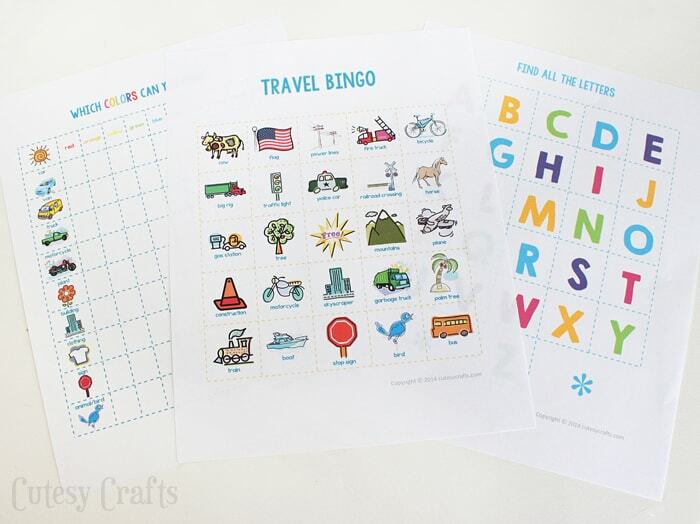 We’ve got the standard, travel bingo and the alphabet game. 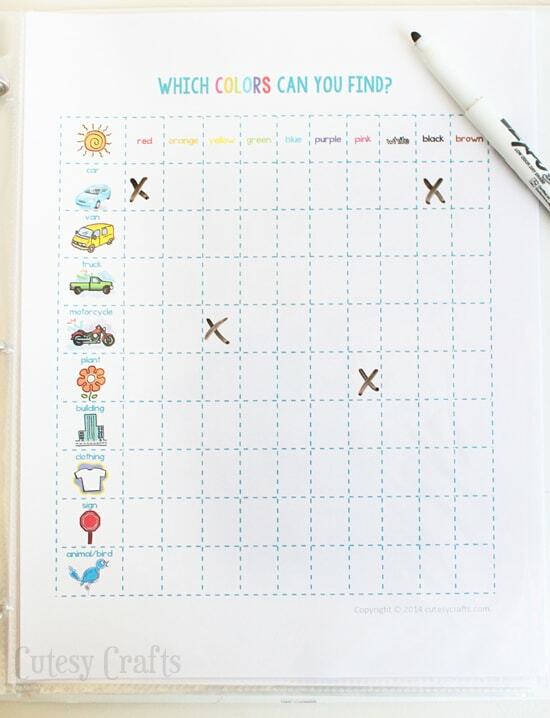 And I also made up a new one where you keep track of all the different-colored things you can find during the entire trip. Put all of the papers into plastic sheet protectors and use a dry-erase marker to make them reusable! 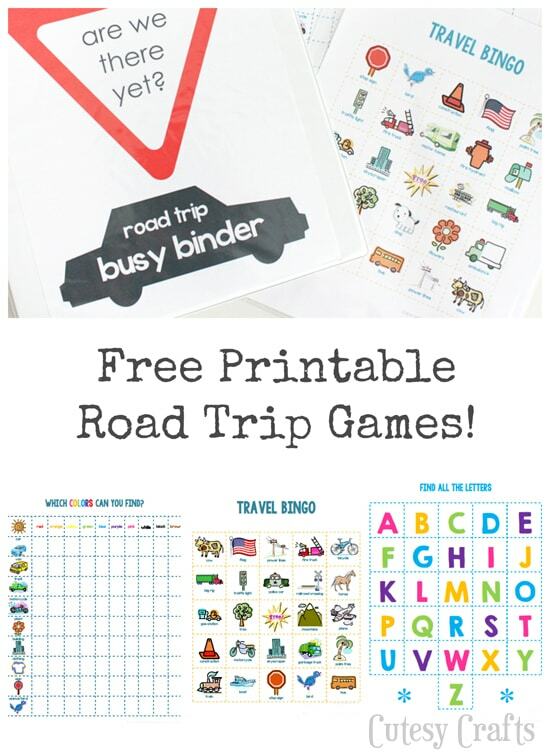 You can get all of the road trip game printables that I created here. There are six different bingo cards in case one of you has six kids. If you have more than that, I’m sorry… in more than one way. I’m joking! Sort of… 😉 I printed out two for each binder just to mix things up when the kids are playing. 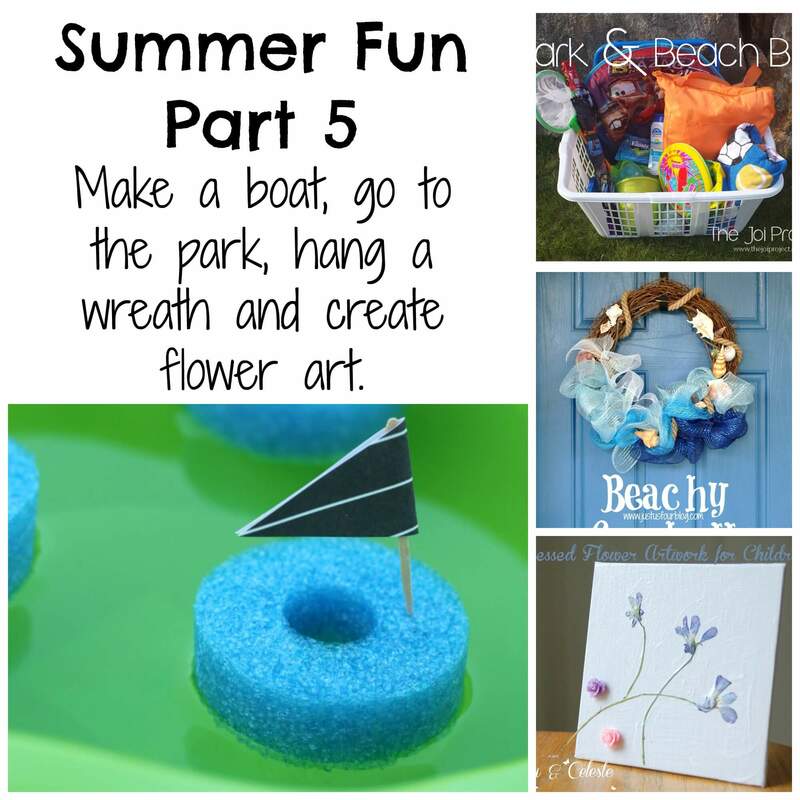 I’m posting this as a part of Nap-Time Creations’ Summer Fun series. Check out these other summer ideas from some fabulous bloggers! Thanks, Emily! I’m really hoping I survive our road trip. Good luck on yours! You can do it! Way to plan ahead…that will help a lot. For our road trip last year I made up these easy magnet/white boards – http://gotstamped.wordpress.com/2013/07/12/diy-white-boards/ You can get those word magnets to make stories (or print your own and glue onto magnets. Thanks, Amanda! What a great idea! My kids would love anything magnetic! Thank you so much! These are great! 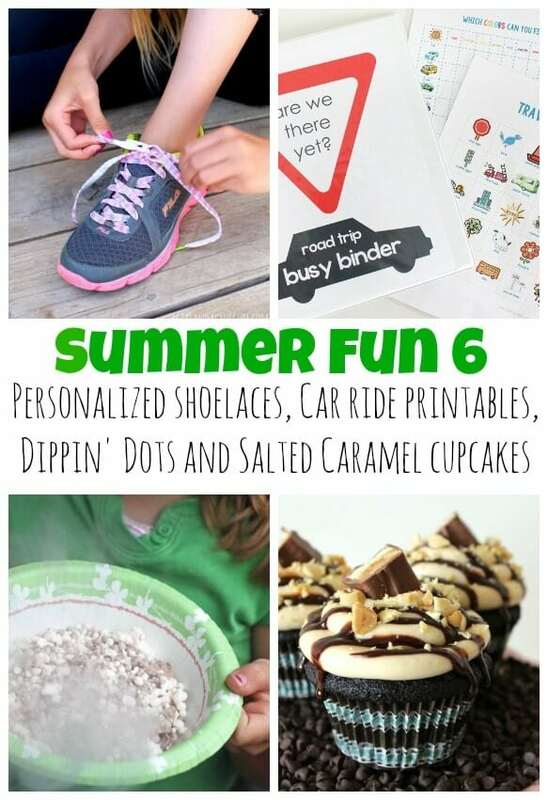 I’ve been searching for activities for my two kids while they are on a 10 hour road trip with their grandparents–without my husband and I! You’re welcome! Oh man, great for you, not so much for the grandparents. Haha! I don’t do well with the kids in the car for that long.